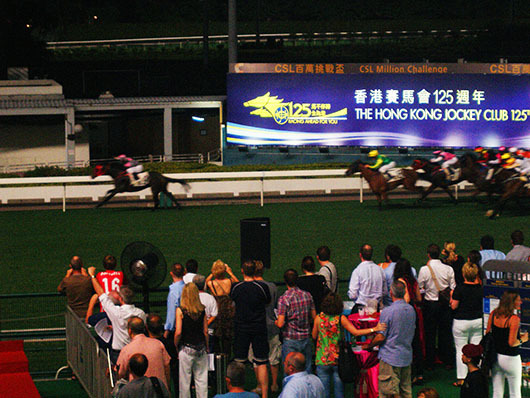 Hard to describe the high of our horse racing to the finish at the Happy Valley Night Races! A fun night filled with great food, drink and loads of atmosphere. I’ve been there!!! Lots of fun! Wasn’t it? We loved the carnival atmosphere. Thanks Stephen. I took your advice Madhu, though I only saw your comment just now. How are you doing? Perfect! Colorful, exotic, full of action. Great entry, Madhu. Looks like a fun place to be. This horse’s fast movement put him way out front. Happy travels to you as well. Fun photo! Love horse races. perfect take for the theme! Sounds like you are having fun. Enjoy! This was from a 2009 trip Marcia. Wish i was there now. I love Hong kong. Never been but looks interesting, I’ll have to add it to the bucket list! Of course we did, and won a cool $180 on a wager of $10 🙂 Loved your post on microlights Jude. But my comment isn’t showing up and I am not able to figure out why. Like the contrast of the movement of the racing horses and the stillness of the spectators. Glad you like it Ruth. Thank you for letting me know. A great evening and winnings too, magic! Oh no no Frizz! We bet $10 each on two races and won $180 total, so not a bad deal eh? Si, night shots can be very disappointing. The appear fine in the little window of the camera but are sorely lacking when viewed through the computer screen! Every so often we are delighted that the not-so-perfect image is perfect for a particular photo op! Great action shot!! I just love the horses! Great entry for the movement challenge! I have been looking at a lot of blogs on this weeks challenge, and have been waiting to come see yours. I love the anti-motion your camera captured of the fan in the crowd of people. Isn’t it? One of my friend’s dad used to be the Steward at the Madras Race Club and we would go regularly, since we got to sit in the airconditioned box with him! Not anymore though. It was cold and wet, a drop in temperature from here to Lech am Arlberg was close to 30 degrees Celsius which was a huge change, and it lead us to lots of spending, eating in different warm places, shopping for clothes and boots :D, but I loved every minute of it Madhu 🙂 Thank you. I know this blogging business can be exhausting, but please don’t give up!